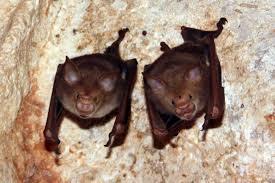 Kitti’s Hog-nosed Bats hanging in a roost cave. The story of Kitti’s Hog-nosed Bat (Craseonycteris thonglongyai), also sometimes referred to as the Bumblebee Bat, is a tiny story and a sad one. This little bat, a native to parts of Thailand and Burma where it lives in limestone caves, measures in at a mere 2.9 to 3.3 cm (1.1 to 1.3 in) in length and weighing only 2 g (0.071 oz)! Tiny. 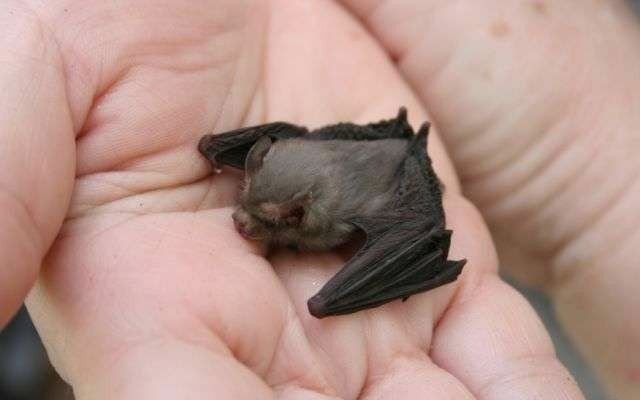 This makes it definitely the smallest bat in the world and puts it into the running for the title of smallest mammal in the world depending on what measurement is used. By length, this bat is the smallest, but by weight the Etruscan Shrew is a little lighter (down to 1.2 g). This ranking has led to a number of the roost sites attracting the attention of tourists wanting to see these little bats in their native habitat, private collectors who sell bats, and even some scientific collectors working for natural history museums. 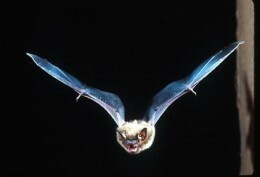 This bat is pretty sensitive to disturbance, so this attention tends to disrupt colonies. Sad. Ecologically, this bat occupies a pretty tiny niche. It only lives in limestone caves along rivers that run through coniferous or deciduous forests. And geographically, this bat is only found in a very small area of Thailand and Burma (Figure X). Tiny. Probably using a lot of hover hunting, Kitti’s Hog-nosed Bats only forage for food for short windows of time, only about 30 min each evening and 20 min just before dawn, during which it eats small flies and spiders. Tiny. Since these foraging trips can be easily interrupted by rains and low temperatures it is likely that climate change will have an effect on the foraging ability of this bat. Sad. Their restricted range, combined with the human disturbance, habitat destruction and small population size are all contributing to a downward population trend. Sad. Evolutionarily, Kitti’s Hog-nosed Bat is the only species in its genus and that is the only genus in that family. So, the little remaining population that exists today represents a pretty separate evolutionary lineage distinct from all others. Tiny. The fact that we may be on the verge of losing this whole family is pretty sad. Even the scientific history of this bad is tiny and sad. It was only discovered relatively recently, in 1973. Tiny. It was discovered by the ornithologist and mammologist Kitti Thonglongya who was famous for discovering many endangered species in India and Thailand. Unfortunately, Kitti Thonglongya died of a sudden and massive heart attack not long after discovering the species, and so the species was actually described to science by his collaborator John E. Hill in 1974. Hill named the little bat after its discoverer. Sad. Kitti’s Hog-nosed Bat in flight. However, Kitti’s Hog-nosed Bat has not gone unnoticed. The IUCN has listed this species as ‘vulnerable,’ and it has been identified as one of the top 10 focal species of the Evolutionarily Distinct and Globally Endangered Project (EDGE Project). EDGE is a project run by the Zoological Society of London to raise awareness and funds for the protection of unique and disappearing species. Hopefully, this attention will benefit these little, and rather adorable, bats in time.